I realised today that I’d gotten too busy these last few months — because I hadn’t been baking bread! So today, during a bit of a chill afternoon, I made a new gluten-free loaf. And it is my new favourite!! It’s a yeasted bread, so it takes a little more planning time than a quick bread (like this Quinoa & Flax Seed Gluten-Free Quick Bread). There are two rising times: one after you first bring the dough together into a ball, and a second rise after you shape the dough into a long sausage-like loaf. I adapted the recipe from a BBC recipe by Dan Lepard (the gluteny bread genius), and learned a new technique: toasting the flax seeds opens up the husks, so that the inside of the seeds can mix with the water in the dough to form a gel. This makes for a softer crumb, and a really delicious loaf. Lepard also includes psyllium husk powder in his recipe. Psyllium husk powder absorbs a lot of water, and like the flax seeds, have a mucilaginous quality. 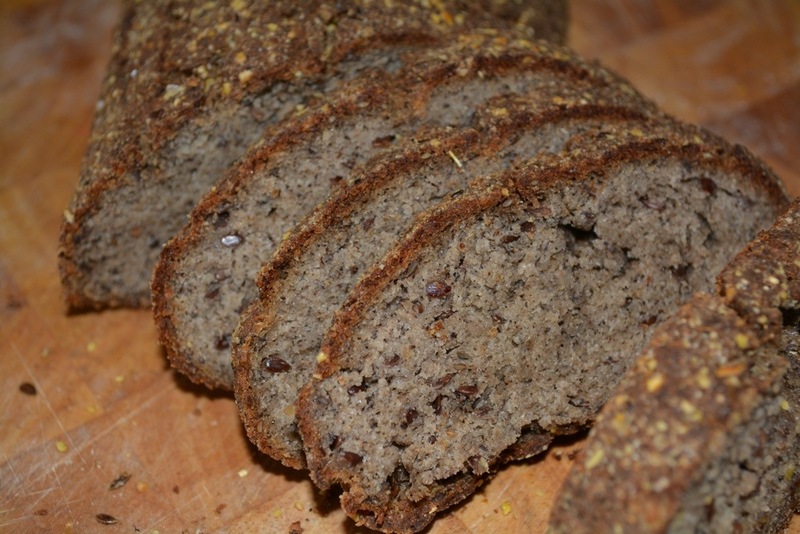 So the combination of the flax seeds and the psyllium husks make for a less crumbly gluten-free bread. You can find psyllium husks at your health food store or bulk store — either as whole husks that you grind, or as a pre-ground powder. 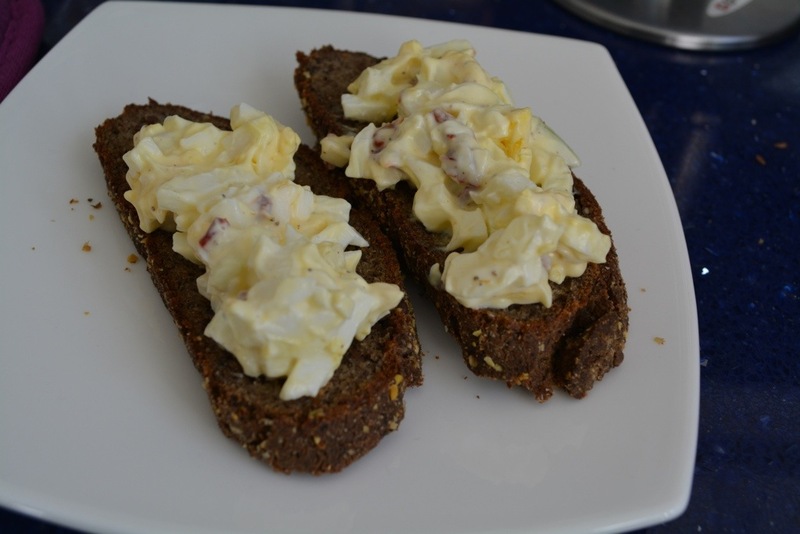 I made this bread specifically to go with some egg salad I’ve been craving. Do you know I fell in love with Mr. KitchenOperas over his egg salad and lattes? 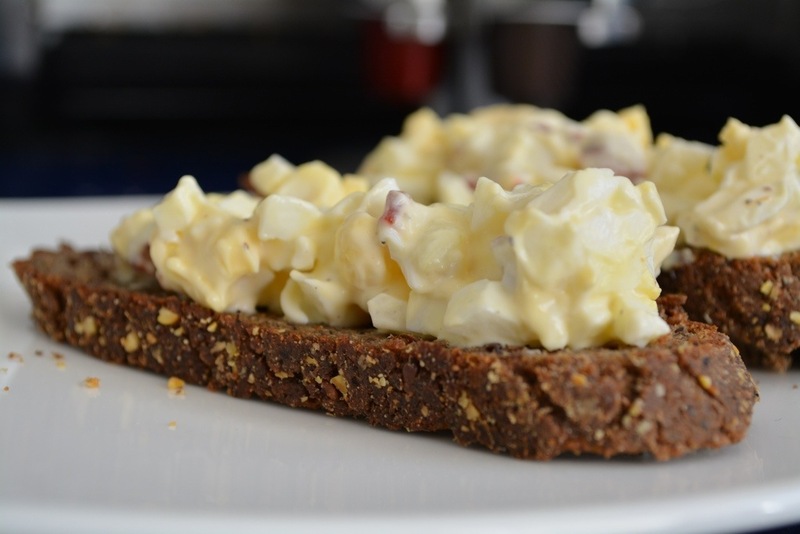 Egg salad has a special place in our hearts, and it’s a great combination with this bread. I also think chickpea salad (make your favourite egg salad recipe with a half a tin of mashed chickpeas), hummus and sprouts, or almond butter and jam would be divine open-faced sandwich toppings on this bread. I love multi-grain breads, so I replaced Lepard’s corn flour (which would make a rather white loaf) with half buckwheat and half quinoa flour. The combination makes a dense and nutty multi-grain bread, with a crispy crust and a soft crumb. I am really in love with the results. This is definitely going to be a new staple around here. Preheat oven to 350F. Place the flax seeds on a cookie sheet, and bake at 350F for 10 minutes. In a small bowl, whisk the water and the yeast together. Add the yogurt and the toasted flax seeds. In a separate large bowl, whisk the quinoa and buckwheat flours, salt, sugar, and psyllium powder together. Pour the yeast mixture over the flour mixture, add the 1/4 cup olive oil, and combine with your hands into a ball of dough. Turn the dough out onto the counter and knead to incorporate all of the ingredients. Form the dough into a ball, and place it in the bowl (covered with plastic wrap or a damp tea towel) for 30 minutes. Line a baking sheet with parchment paper. After the dough has rested for the 30 minutes, roll the dough into a sausage shape. Brush the dough with the extra olive oil, and cover with a damp tea towel. Let rest for another 30 minutes. Preheat the oven to 465F, and slash through the top of the dough with a sharp knife. Sprinkle the dough with the cornmeal, and bake at 465F for 40 minutes. Place the dough on a wire rack to cool completely before slicing. 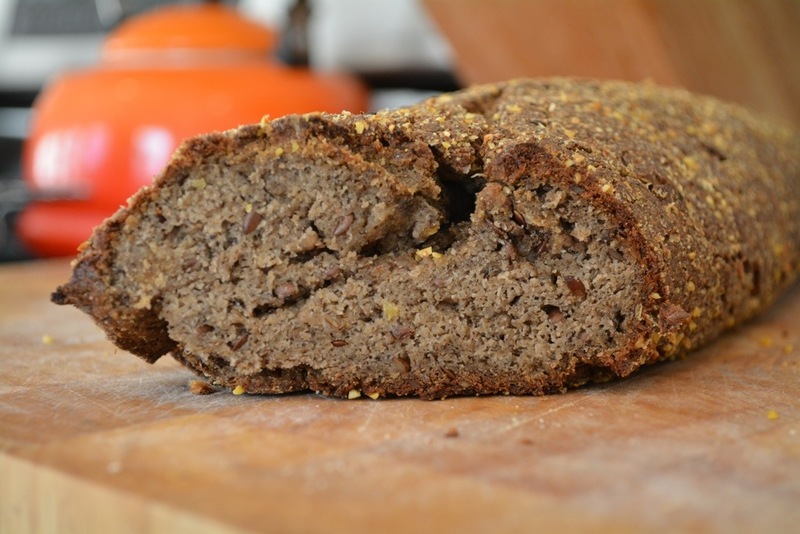 Looks so good – and a bread recipe I might be able to make! It’s very doable, Laura! Let me know how it goes if you give it a try! Let me know if you try it with vegan yogurt 🙂 I would also try coconut milk as a substitution here. Oh WOW! Very cool! Great pics, too! This looks amazing! I have been craving a crusty yeasty bread since committing to gluten free. I read your other post about teaching gluten free baking and would love to have some of your other recipes for yeasty gf breads, I also hate that so many other recipes call for eggs, starches and gums. Xanthan gum makes me sick and the starches are just devoid of nutritional value as you said, and I’ve always loved everything multi grain. I don’t have quinoa flour (and it’s so expensive! ), but I think I’m going to try subbing it out with millet and/or oat flour. I have found the combo of millet and oat flour to work really well in a lot of quick bread recipes; like scones, muffins, pancakes, so I’m hoping it will work equally well here with my sprouted buckwheat flour.